See the text of Fr. Rosica's address below. 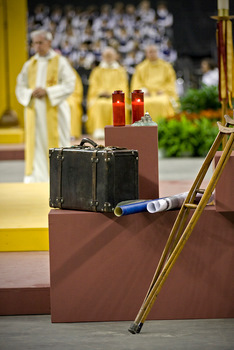 Photo: Deborah Gyapong/Canadian Catholic News. The Archbishop of Montreal Cardinal Jean-Claude Turcotte welcomed close to 600 university students across Canada to Rise Up! 2010; with Fr. 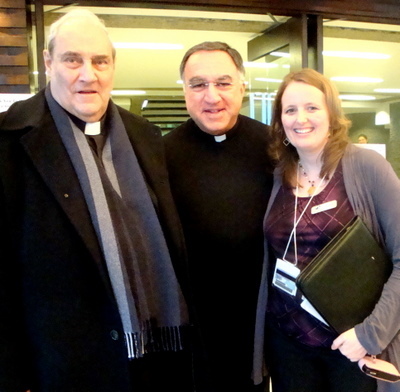 Thomas Rosica CSB; and CCO staffer Jackie O'Donnell, who organized the conference. Keynote Address of Fr. Thomas Rosica, C.S.B. It is an honor and privilege to begin the 2010 Rise Up Conference here in Montreal, Brother André’s own city. For the past nine months, we at Salt + Light Television have been immersed in the story of Brother André as we made the documentary “God’s Doorkeeper” (English) and “Portier de Dieu” (en français.) Brother André has been part of my own life since I was a 16 year-old high school student and visited St. Joseph’s Oratory for the first time. I have returned to Brother André many, many times over the past years. Let me tell you a little about Canada’s first native-born male saint. The holiness of Blessed Cardinal Newman, remembered not only, but primarily, for the amazing library of scholarly books, essays, poems, letters, and sermons he left behind, provides an ironic contrast to that of Brother André, an uneducated Quebecois Holy Cross lay brother who would have been unable to read almost anything Cardinal Newman wrote. 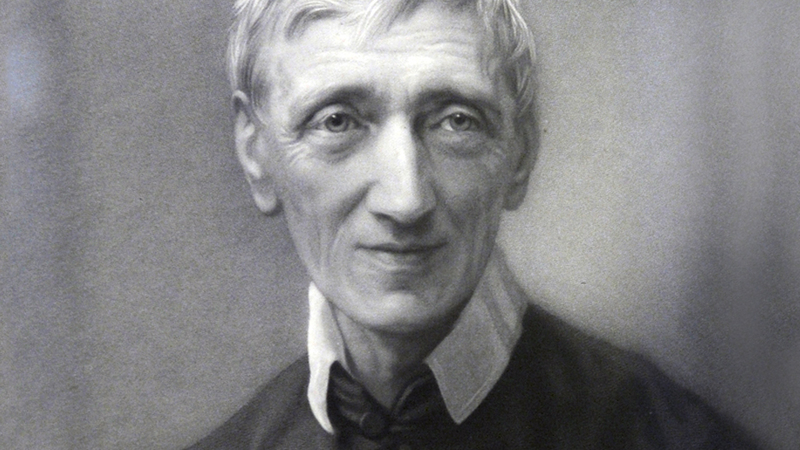 The “definite service” which Brother André was assigned, and which the Church, in canonizing him, insists is every bit as important and necessary as Cardinal Newman’s scholarship, could not have been simpler: Brother André’s service was to open the door and to teach us what charity in truth is all about. Born Alfred Bessette into a large Catholic family in 1845 in the Quebec village of Saint-Grégoire d’Iberville, not far from here, the baby was so frail as a newborn that his father, Isaac, didn’t expect him to live for more than a day. The Bessette family was besieged with tragedies. In 1855, when Alfred was 10 years old, his father, Isaac died in a logging accident. In order to provide for her children, Alfred’s mother, Clothilde was forced to separate them from each other and sent them to live with various members of their extended family. Only Alfred was able to stay with his mother due to his own delicate health. Two years later Madame Bessette died of tuberculosis. Alfred was orphaned at a young age. At age 18, he set out for the United States where he followed the path of many French-Canadians before him, working for four years on farms, in factories and in textile mills in New England. Throughout his American sojourn, Alfred remained frail and sickly, as he searched for his real vocation. When Alfred applied for vows one year later, his religious superiors decided they could not accept him knowing that his poor health would be an impediment to future ministry. Alfred was devastated. A few weeks later, the Bishop of Montreal visited Collège Notre-Dame, which was also the location of the novitiate community. Alfred begged the Bishop to intercede with the Holy Cross superiors, saying “My only ambition is to serve God in the most humble tasks.” The superiors relented and admitted Alfred to vows as a brother of Holy Cross. On February 2, 1874, Alfred chose as his religious name “André” in honor of his parish priest who had a major influence on his life. For the next 40 years Brother André worked as a porter at the Collège Notre-Dame in the Montreal neighborhood of Côtes-des-Neiges. 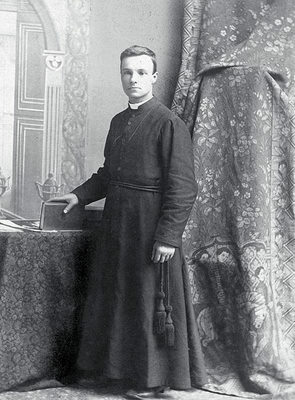 Speaking about his assignment as doorman, he once quipped, “When I joined this community, the superiors showed me the door.” As porter of the College, Brother André lived in a small room located near the main entrance, and did many menial tasks such as washing the floors and windows, cleaning lamps, bringing in the firewood and looking after the laundry of the students. He was also the students’ barber. While some supported him, many others opposed him and even considered him dangerous to the well being of the school’s reputation because they regarded him as a charlatan. Others were concerned for the health of the children, fearing the possibility of contagion in the school spread from diseases carried by the sick who frequented Brother André. As the tensions increased at the College with so many of the sick coming to see the porter, the school officials permitted him to receive the sick in the nearby tramway station rather than the College. Brother André always had a strong devotion to St. Joseph, and in 1900 received permission to raise money for a shrine to St. Joseph. The first modest structure was constructed in 1904. Holy Cross authorities allowed for a room to be added to the Chapel and Brother André was assigned to live in that room where he could receive pilgrims and pray with and for them. He spent his days seeing sick people who came to him, and spent his evenings visiting the sick who could not make it to the Oratory. Construction on what would become known as Saint Joseph’s Oratory began in 1914. A crypt church seating 1,000 was completed in 1917. By the 1920’s the Oratory hosted over one million pilgrims annually, and hundreds of cures were attributed to his prayers every year. 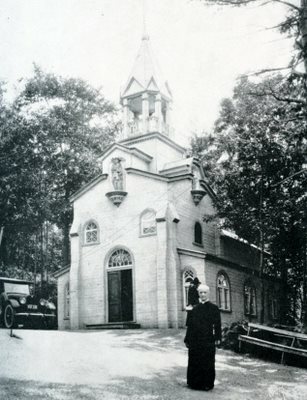 From that small chapel on the slopes of Mount Royal came forth the world’s largest oratory in honor of St. Joseph. Its alcoves are still crammed with the canes and crutches of those who no longer needed them after their prayers were answered. Between his dedication to prayer and the demands of his ministry, Brother André maintained an exhausting schedule. In the last decades of his life, he spent long days receiving sick people at the Oratory, only to spend his evenings visiting even more sick people in homes or hospitals. Yet he never sought to attract a following for himself; his exhaustive labors were always dedicated to leading others to God. Despite the great works God accomplished through him, he was always content to be known as "St. Joseph's little puppy". Brother André replied: “How can you say such offensive words about Saint Joseph?”, extremely annoyed. And in his extreme indignation, he left the premises and went straight to bed! Aware of his imperfections, he had the habit of asking his friends: “Pray for my conversion!” Indeed, the saints have to struggle constantly with the weaknesses of their nature, and it is this very struggle at all times that characterizes holiness. Shortly thereafter he was hospitalized with acute gastritis. As he lay in hospital, the completion of the basilica occupied his thoughts, because he was aware of the good that Saint Joseph accomplished on Mont-Royal. On Wednesday, January 6, 1937, at age 91, he gave up his soul to God and entered eternal life. It was an incredible thing to see how quickly the news spread and to witness the huge crowds of people streaming to Montreal from every part of Canada, the East Coast of the United States and many other parts of the world. In an age that didn’t have e-mail, text messaging, faxes or other means of instant communication that we take for granted today, the word of Brother André’s death spread like wildfire. Expressions of sympathy poured into the Oratory from around the world. His body lay in state in the Oratory - which was kept open day and night - until January 12. 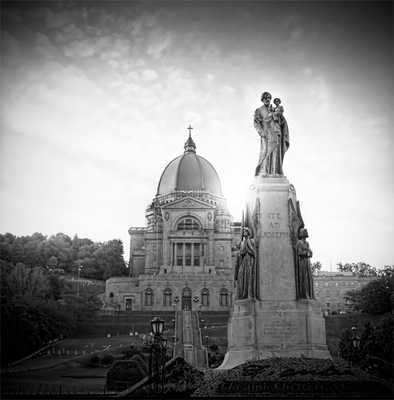 An initial funeral service was held in the cathedral in Montreal, and a second one at St Joseph's Oratory. More than one million people came from all over to pay tribute to him, to weep for him, and to pray beside him. More than seven decades after his death in Montreal, this humble porter remains an inspiration to Catholics — not only for his faith in St. Joseph, Canada’s patron saint, but also for his devotion to the sick who came to him for help and later claimed to be healed by him. 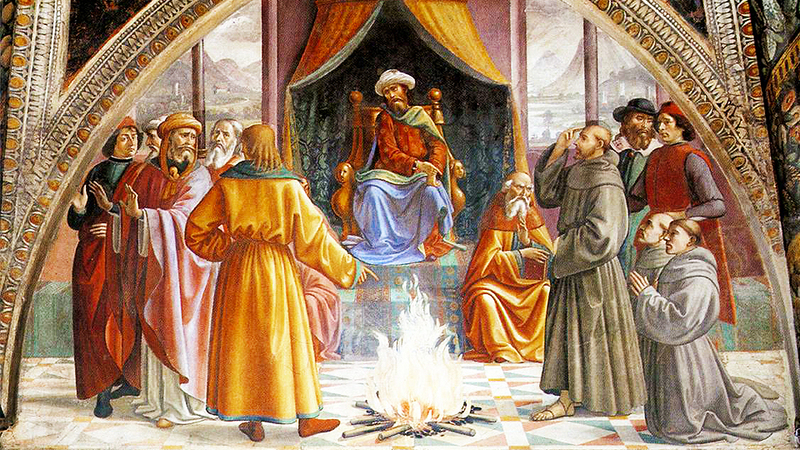 Andre's climb to sainthood had nothing to do with taking part in holy battles, like Joan of Arc, the writing of great works of theology, like Thomas Aquinas or Cardinal Newman, or the creation of a new religious orders, like Francis of Assisi or Dominic de Guzman. André’s story was about accepting the little he had and turning it into a holy act. His story is the antithesis of what makes someone famous, notable and heroic today. He would have never been hired as a consultant or been invited to a talk show – no more so than someone who shines shoes or collects garbage for a living would ever be noted for his good work. He could hardly read or write, didn’t go to college or university. He never had a blog or a vlog, nor did he have the privilege of belonging to a movement like CCO! On October 17, 2010, in a majestic ceremony in St. Peter’s Square, Brother André Bessette “won the gold medal” in the words of Jean-Claude Cardinal Turcotte, Archbishop of Montreal. The frail, little brother from Mount Royal, whom no one really wanted in the beginning, is now Canada’s first native born male Saint. In an era of endless celebrity worship and enduring religious scandals, there is something majestic – beautiful – miraculous – about the timeless ritual of sainthood that shone a spotlight on little Brother André of Quebec this past October. Brother André grew up to become a true folk hero because, like other role models in a bygone era, he was seen to be close to the people, unburdened by pride, and focused on other people. 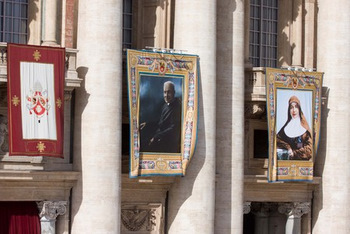 The miracle leading to his canonization occurred in 1999 when a nine-year old boy had been the victim of an automobile accident, leaving him with a serious head and brain injury and putting him in an irreversible coma leading toward death. The prayers of the people closest to him, along with the intercession of Brother André, brought him back to consciousness and health, and this was deemed scientifically unexplainable by medical experts. Interestingly enough, that young man is 20 years old- one of your generation. Celebrating sainthood is never easy for the rest of us on earth. We tend to create new images of these people because we are afraid of how they challenge us today. The image of Brother André in our midst must be one grounded in the humility and love he personified. Tonight I ask you to consider two key points about Brother André that have much relevance for each of us in this room, and especially for this great Catholic university movement we now know as Catholic Christian Outreach. 1) With little formal education, Brother André Bessette seems like an unlikely "educator in the faith". True, he never exercised a formal ministry as a teacher. Yet he saw countless opportunities in his ministry to teach people the faith, about charity, and about truth. He loved to spend time talking with people about St. Joseph, or about the Lord's Passion. And not only did he teach people how to pray, he showed them how to pray by praying with them. His consistent faithfulness underscores our obligation and our opportunity to educate people in the faith in every aspect of our daily work. 2) Brother André trusted in Divine Providence. Nowhere was André's trust in divine providence more evident than in the foundation and expansion of St. Joseph's Oratory. Despite the many obstacles he encountered in its construction, including a World War, somehow he knew in his heart that this shrine was God's will. Time after time, friends and benefactors came forward to lend their skills and resources to this project when all seemed lost. During one work stoppage, when the basilica still lacked a roof, Brother André simply said, "Put a statue of Saint Joseph in the center of the church, and if he wants a roof over his head, he'll take care of it." He always had complete confidence that, if he were really doing the Lord's will, the Lord would bring it to fruition. 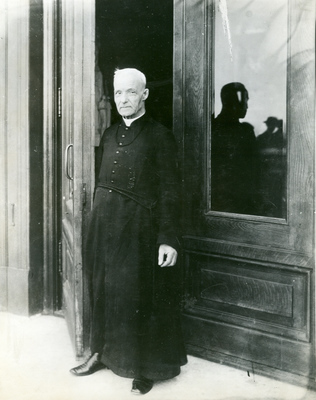 In his day, Brother André Bessette was a porter on Mount Royal. Now he is one of Heaven’s special gatekeepers. He left us a powerful example of how to welcome strangers, the homeless, the sick, the poor and hungry into our communities. Some will come to our doors rejoicing, and others in fear; some will come healed and others to seek that healing. The important thing is that we open doors and build bridges to those who come, instead of erecting obstacles and barriers. Catholic Christian Outreach (CCO) has now arrived at a particular moment in its history, growth and maturity when this movement must begin to formally identify and name its patron saints who will guide and protect the movement from heaven. Divine Providence is indicating to you your patrons and heavenly friends. Among them are those we have already met together: St. Teresa Benedicta of the Cross (Edith Stein) who teaches us about the need for faith and reason in all of our educational pursuits; St. Gianna Beretta Molla who models for us what it means to be lovers and bearers of life; Blessed Pier Giorgio Frassati, the young mountain climber from Italy who exemplifies for us the quest for ordinary holiness in our age; Blessed John Henry Cardinal Newman, the wise and holy patron of university chaplaincies throughout the world who teaches us about conscience and faith, and the beloved Servant of God, John Paul II, who knew and loved this movement and taught us not to be afraid as we set out into the deep. May CCO and the young people of Canada and far beyond learn from this great, little man who was truly one of God’s masterpieces in our time. St. André of Montreal, Saint Brother André, pray for us and watch over us. Show us how to put charity into action and to discover the truth of Christianity as we practice that charity each day of our lives. Help us to become the canvases upon which God may continue to paint masterpieces in our time.